Over at CWWCC we are half way through our current challenge favourite hobby or activity. It can be anything from walking the dog to football or fishing. I chose Owl because I knew I could use it as my favourite activity or hobby. One of the things we like to do as a family is visit wildlife parks. We don't get to do it as much now the children are getting older. Here is a picture I have of my daughter at about the age of 8. We were visiting a place called Ponderosa Rural Theraputic Centre. At Ponderosa people are allowed to interact with certain creatures, under supervision of course. 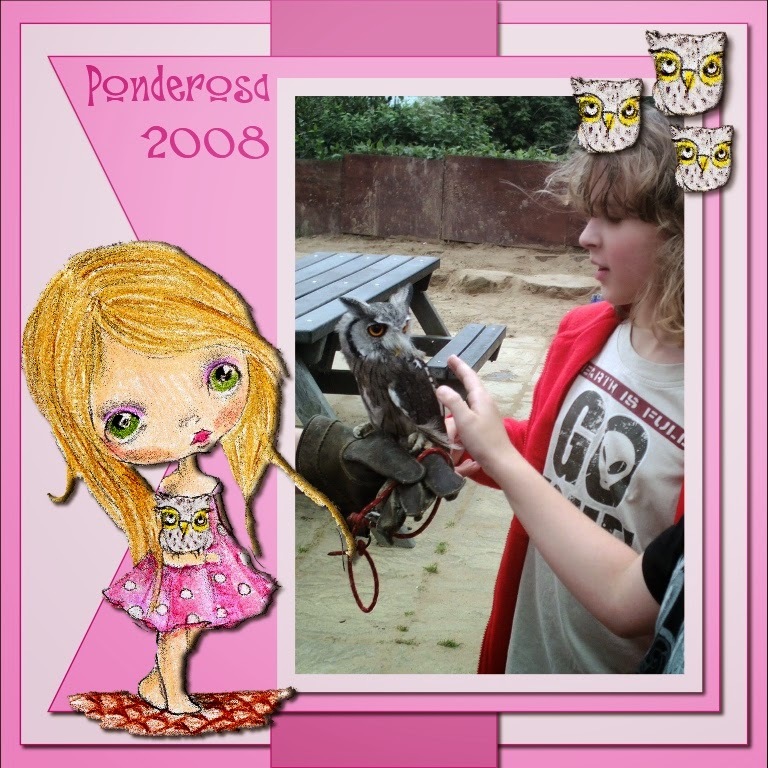 My daughter loved stoking the owl so I thought is was a great photo to use with the image I had. I coloured the image using my Spectum Noir pencils. I don't have a lot of room for crafting at the moment as my son is still making his Judge Dredd costume and we have pieces all over the house. I scanned the coloured image in and used my Craft Artist program to make a scrapbook page. Hop over and show us your project using the theme Favourite activity or hobby. Oh, what a cute owl. Now that reminds my why I always loved owls. Thank you for playing along with our NO design paper challenge this week at Crafty Catz. Great layout - love the little owls in the corner.